After a rousing adventure over in Lithuania, the Polish fun continues today a little further west. My latest read involves an eccentric old(?) woman, an isolated community and a series of mysterious murders that have baffled the local police. However, out in the forests some animals are waiting and watching – surely they couldn’t have anything to do with it, could they? 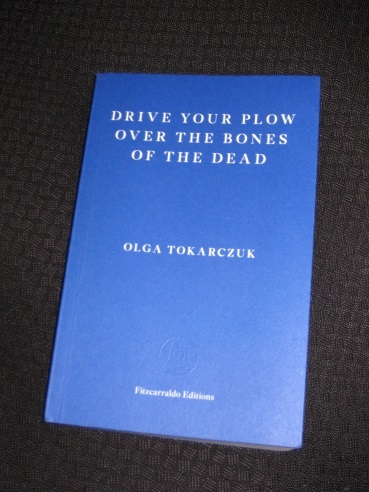 Most readers will have heard about Polish writer Olga Tokarczuk’s Man Booker International Prize winning novel Flights (translated by Jennifer Croft), and Fitzcarraldo Editions have wasted no time in bringing out a second Tokarczuk work, Drive Your Plow Over the Bones of the Dead (this time translated by Antonia Lloyd-Jones). The novel, set in the rural south-west of Poland, close to the Czech border, is narrated by Janina Duszejko, a semi-retired woman living by herself with only two neighbours for company, and is a clever novel bringing together flights of fancy and the best traditions of noir fiction. If you’ve read Flights, then you probably weren’t expecting a murder mystery from Tokarczuk’s next book, but that’s exactly what we get. As the story unwinds at a leisurely pace, with Janina rambling on about life in her tiny corner of Poland, more men meet their unlikely demise in the background. The police are clueless (in general, not just regarding this case), and the people in the neighbouring villages begin to get nervous as the deaths come ever closer to home. It’s this belief that allows her to entertain an intriguing notion regarding the murders. Having noticed the deer watching outside the house of the first victim, and the hoof-prints surrounding the second body, she begins to believe that the animals may have decided to fight back. At first, it appears to be an absurd notion, but gradually the idea of animals running wild grabs the imagination of the frightened locals. Part of the success of the book is due to the isolated setting, with its harsh winters, beautiful springs and the foreboding woods, but the supporting cast also plays its part. Janina seems to have attracted a group of misfits around her, people who, like her, don’t quite fit into the society the writer critiques. In addition to Oddball, there’s Dizzy, her William-Blake-translating former student; Good News, the woman from the second-hand clothes shop; and Boros, an entomologist who turns up by chance and stays longer than expected. This group of people, randomly thrown together, come to form a different kind of community, and make up a support group for Janina. The heart of the novel, though is Janina herself, passionate believer of astrology, English teacher, part-time translator, former bridge-builder and more besides. While constantly concerned about her Ailments (she’s occasionally stricken down with joint pains, rashes and streaming eyes), she’s surprisingly independent and fearless, capable of standing up to the villagers. One of the constant strands through the novel is her determination for the police to answer her many letters accusing the animals of the murders (something the hapless cops would rather just forget about). With the whole novel told through her eyes, Janina’s voice is key, so luckily Lloyd-Jones, one of the biggest names in Polish-English literary translation, is on board to get it right. Janina’s quirks are caught beautifully, and the excellently rendered voice pulls us along through the story, with never a false step. I loved Flights, and was keen to explore more of her work. But I’m a little wary because of the animal content – as a vegan, am I going to find it too graphic, I wonder?? Laura – I have to admit that the thriller aspect was the part I least liked about this – I much preferred the philosophical musings and ramblings side! There is a Polish film by Agnieszka Holland based on this novel. It’s called Pokot (Spoor). Tokarczuk wrote its script. Recently read this book – very different but equally as fantastic as “Flights.” Ordered the film adaptation from Amazon (as referenced in Jack’s post) and was equally delighted.